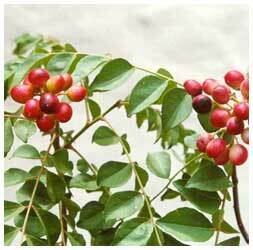 Description: It is an erect, branched and evergreen shrub with spreading dark green foliage. Leaves of the plant are dotted with minute glands and are strongly aromatic. The plant bears clusters of white fragrant flowers. Fruits are smooth, pea-sized berries that turn purplish black when ripe. How to Grow: In home herbal garden, one plant on the ground where it may occupy an area of about 1 sq. m is adequate. Due to its dense green foliage, it also makes a beautiful pot plant and can be raised in a pot of 25-30 cm size. Care regime: When grown in the backyard, this plant doesn't need much caring, while occasional watering is sufficient for its growth. However, when grown in a pot, watering regime of thrice a week is adequate. Collection: Leaves can be collected by plucking with hand. The plant continues to yield leaves for many years.